Father Williams Powers came to Our Lady of Lourdes Parish in January 1909. 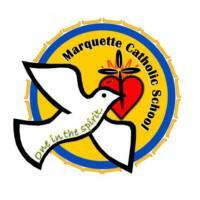 It was he who laid the groundwork for the construction of the Marquette Catholic School. The building was begun on May 15, 1915; and completed five months later at the cost of $70,000. Monies for the building were received by individual pledges and donations. The building was designed by Holstead & Sullivan, a Duluth firm; the contractor was Bowe-Burke Company of Duluth and Minneapolis. 1969 July – School Board Corporation is formed. The school is leased from Our Lady of Lourdes Parish. 1970 May – Our Lady of Lourdes and Saint John the Baptist Parishes merge to form Holy Spirit Parish.